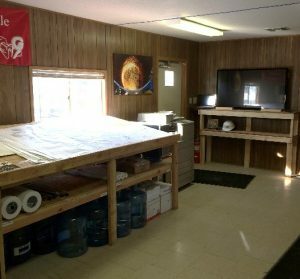 Jobsite Trailer Transformation with Lean 5S | Grunau Company, Inc.
A construction jobsite trailer is often small and cramped so it’s critical to be clean and organized in order to get the job done efficiently. The Lean 5S tool of Lean Construction came in very handy for the transformation at MRMC. 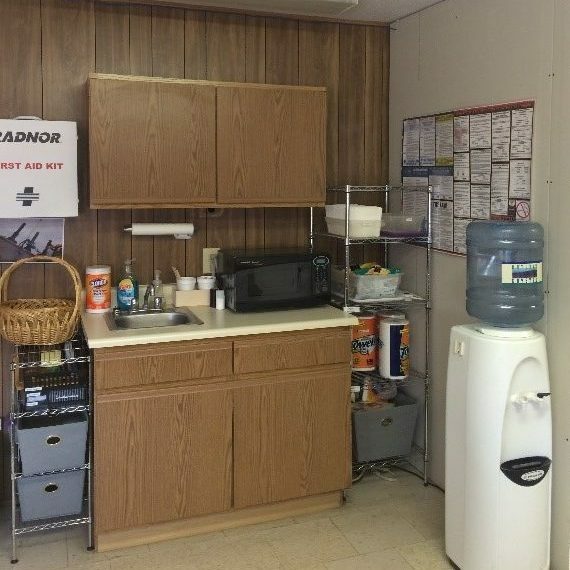 After one year on site at Milwaukee Regional Medical Center, the common areas in the Grunau trailer started to look shabby. It took more than 30 seconds to find extra supplies. The kitchenette counter was constantly cluttered with snacks, which made it difficult to even open the microwave door. Three of our employees held a Lean 5S event to clean up and make a few simple changes. In the kitchenette, wire shelving and bins designated for snacks were added. Extra paper products and office supplies were also moved to the new shelving. The photo above shows the reorganized kitchenette. In the work area before 5S, old plan sets used good shelf space. While paper towels, napkins, & toilet paper were stuffed underneath the plan tables. Field supplies were scattered on the floor & across shelves. Paper reams even blocked the copier trays. When the team reorganized during the Lean 5 event, unused plans were recycled. Field supplies and safety gear were consolidated into one area. Paper reams & rolls were relocated under the plan table. Labels were also applied and weekly auditing by one of the employees helps sustain the newly organized work space. 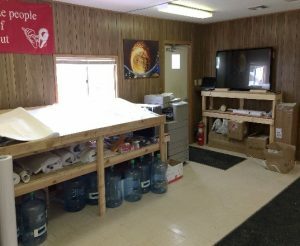 Now when employees and visitors walk into the jobsite trailer, they see there is a place for everything and everything is in its place.